Remember the Dean EVO 60 I accidentally won on eBay last year? The P90s were, of course, quite noisy. So I sprang for a set of GFS AlNiCo Gold Foil humbuckers. Low output - the bridge is wound to 6k and the neck 5.6k. They’re sorta in between true P90s and humbuckers. I like ‘em! Something different! Wow! They look great. Very unique! They look great on that guitar. I stuck the same pickups in a custom build and I like 'em a lot. Not really a P90 tone. Closer to underwound Filtertrons, or DeArmond Gold Tones. Pretty hi-fi sounding. They do a great job of noise cancelation too. I started with a 300k volume but it was too dark. I put a 500k in there and it’s just right. They’re not as bright as a standard sized under wound HB. That surprised me. I coupled the volume and tone via a .022uF cap. That adds to the voicing. Working in this Dean it occurred to me that this is pretty-much a chambered body. It seems like there’s lots of open space under the top. I’ll spend more time with it today. I’m not sure how to catagorize the tone. In the future if you're looking for P90s, Lollar winds a great set. I still have an opening in the herd for just such a guitar. If the right one of these pops up at the right price this year, it's mine. There are a couple Agile offerings too. I would consider those too as a mod platform. She was such a great player that I kept her. So I gutted her and put in some Lollar Vintage T's. In fact, snotty has the old lawsuit headstock. 2004? I still have an ‘04 Agile AL3000P. I have a pair of HB-sized P90-ish pickups from Aaron installed. It does those tones pretty darn well. My mind is running with thoughts on this. I could build my P90 instrument. I don’t mind it being a bolt-neck. I’m inclined to do that because I could get the neck profile I want. Zackly. I'm not sure of the year but '04 is pretty close. I just looked through my gear pics and the first pic of Snotty is July 2014. 14 years...Wow! My only older guitar is Rosie (Carvin Bolt) at 17 years. It wasn’t long after ‘04 that Gibson pressured them into changing the headstock. Before ‘04 they bodies didn’t have the neutered horn. I had a pre-neutered 3000 but didn't bond with it. 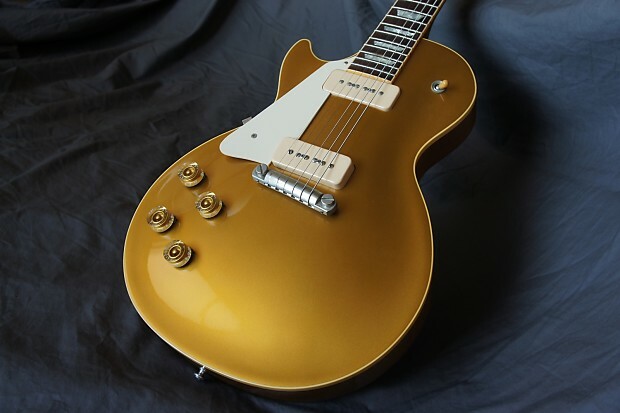 A TOM bridge often does intonate better than a wrap-tail bar, but done right, the plain bar bridge just has That Magical Tone like some of the LP Juniors are famous for.